I am very excited about this movie, and it is all because of 12 frames in the official trailer. 1) A girl is playing the drums. 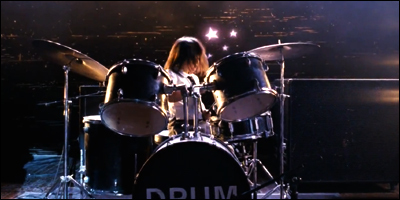 2) The drums say "drum" on them. 3) Her playing synchronises perfectly with the soundtrack. 4) The soundtrack is The Prodigy's Invaders Must Die. 5) When she hits the hi-hat, animated stars burst onto the screen. Even if the rest of the film is a disaster zone (and it won't be), I'm turning up just to see this scene.